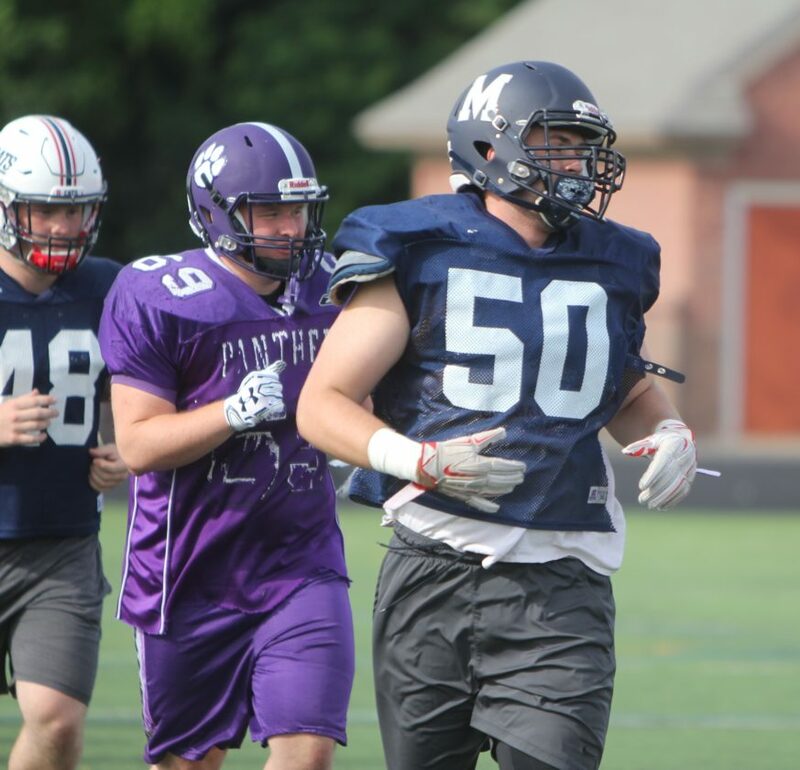 Staff photo by TOM KING Milford's Michael Boucher (50) was not only leading the CHaD West team through early conditioning drills, he is the team's leading fundraiser for Saturday's game. MANCHESTER – If you are a local business owner in the Milford area and outskirts of Greater Nashua, chances are you know recent Milford High School graduate Michael Boucher. And not just because he was a superb lineman for the Spartans football team. In the last few months, Boucher has learned the fine art of fundraising, and is the West Team’s top fundraiser having gotten donations totaling an incredible $7,371. Boucher has been hooked on the CHaD All-Star Football Game ever since he got the email telling him he had been selected to the West squad that will face the East on Saturday at 1 p.m. at the University of New Hampshire. “It’s more of an honor than anything else,” Boucher said. “I went to the orientation with my Dad and it really hit me hard that this isn’t just a football game. It’s more of an outlet for kids who aren’t able to pay their hospital bills. Which is exactly what Boucher did. Touched by the enormity of the cause, Boucher literally hit the streets to raise money, answering the challenge the organization gives to the players. When he got an email that he would be in the game, Boucher was happy to follow in the footsteps of former Milford players who have taken part in the game. But he wanted to do more, and set a fundraising goal of $5,000. “When my Dad and I came back from the orientation, we said, ‘We have to do this, what are we doing,'” Boucher said. First thing was to go to family members, then Milford High School helped him organize a dodgeball tournament that raised $1,000. But he noticed that other players were getting donations from businesses, and that’s when Boucher decided to take things to another level. But for a high school senior to basically go out on what could be termed a sales call, with no prior experience, takes some bravery. Welcome to the world of sales, right? He was with his girlfriend, Jacqueline Dumont, that first day in February, going around the Milford Oval. Doors weren’t exactly opening. Door-to-door is hard enough. But Boucher and Dumont Plan B was something a little easier, but still challenging: Cold calling. Boucher was a Division II First Team All-State player, and will take his skills to Saint Anselm in the fall. It didn’t take West coach Eric Brown of Concord long to select Boucher for the team once he saw him on film. If he’s as good a player in college as he has been as a salesman, he’ll be successful. Boucher’s efforts should make a lot of others feel good, too.